Repeat Mode ON: 10 Bollywood Babes Who Wore The Same Outfit Again, Without Any Regrets! Women all around the world suffer from something called the 'i have nothing to wear' syndrome at least once in their life. And to this case, our Bollywood actresses are no exception. No matter how much we hate wearing the same outfit twice, we all have those heart-wrecking moments when we end up picking out the same dress we have worn multiple times. The only exception we can make is to not post the pictures on Instagram. But you that feeling right? Staring in your wardrobe for hours and to not be able to decide if we have something to wear. The very popular star kid, Janhvi Kapoor is just like us, when it comes to repeating outfits. She recently gained a lot of attention on social media for repeating her outfits and guess what we can totally relate to her! Well, Janhvi is not the only actress doing that, there are a few other Bollywood biggies who have dared to challenge this cliche that celebs cannot repeat their outfits at another occasion and kill it in vogue. TBH, they know how to do it, better than us every single time and another shocking yet great fact is that they themselves choose to wear the same clothes. Here are a few more Bollywood actresses who were found repeating clothes and we are crushing over them even more for being able to do so! Janhvi wore this multicoloured Caroline Constas top with a pair of ripped denim at the Ed Sheeran concert in India (2017). She also wore the same top in one of her pictures from her US vacation, back in 2016. 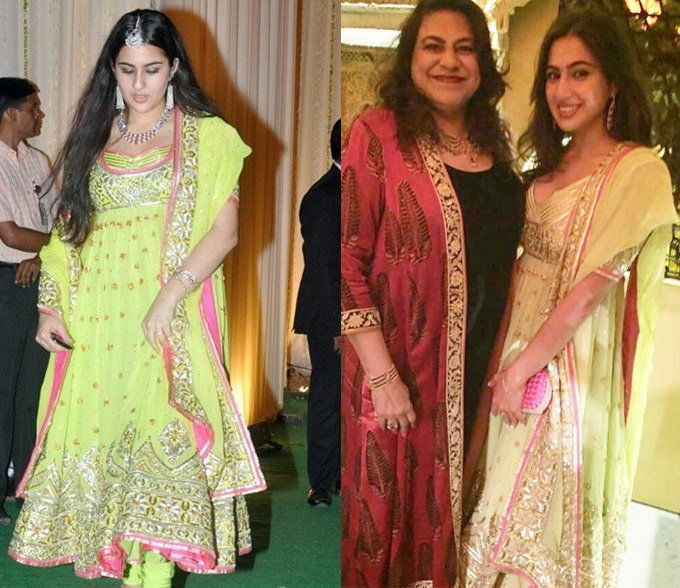 Sara wore this stunning Abu Jani-Sandeep Khosla Anarkali in neon green colour for a Diwali party in 2017 and also donned the same outfit in 2012 for Saif and Kareena's wedding reception. However, she did modify the neckline for a more plunging look. Deepika Padukone wore this lacy off-shoulder dress at Shahrukh Khan's birthday party in 2017 and looked gorgeous as ever. She had worn the same outfit to the IIFA Awards back in 2016. Malaika wore this check crop top with denim and white sneakers while she was on a vacation in US in the year 2017. She later, in the same year, paired the same top with a white ruffled skirt for a brunch get together. Parineeti wore this Hemant Nandita black mini net dress for a shoot in Dubai in 2017 and she also wore the same dress at the Priyanka and Nick's post roka celebrations. Kangana donned this checkered, front-slit pencil skirt and bralette top for two different movie promotion events and she looks absolutely breathtaking both the times. 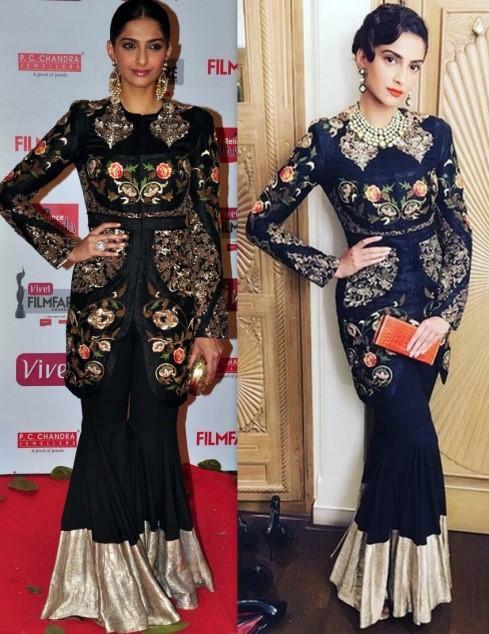 The fashion diva of Bollywood, Sonam Kapoor Ahuja wore this stunning Anamika Khanna jacket with a black sharara at the IIFA awards in 2014. She then repeated the same outfit at another event during the same year. 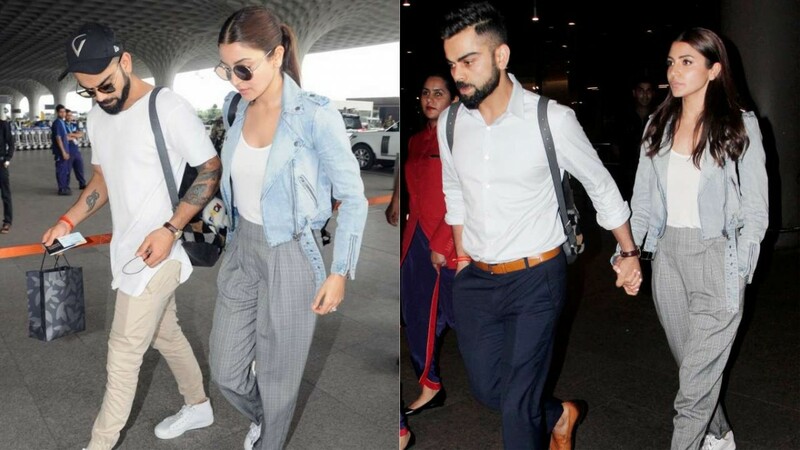 Anushka Sharma Kohli was spotted at the airport wearing a grey checkered trouser paired with a white cami and a cropped denim jacket twice. Once she stepped out in the outfit while accompanying her hubby Virat Kohli to Banglore for a match and the next time she was seen at the airport slaying it like a boss. 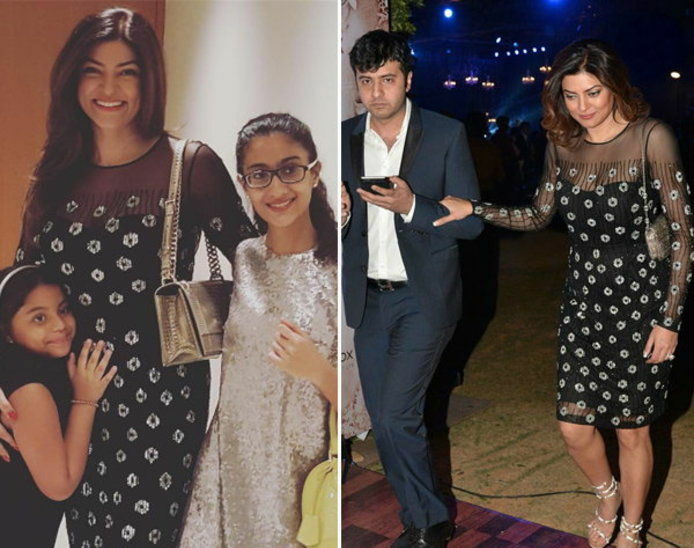 Sushmita Sen wore this black sheer dress with white graphics on her 41st birthday party. she also wore the same dress a few months ago for a date with ex-boyfriend Ritik Bhasin. Alia Bhatt seems to be loving this particular graphic tee FROM french Connection so much that she decided to wear it twice. The actress was spotted wearing it multiple times while styling it in a unique way every other time. Here we can see her wearing the tee with black leather skirt as well as a pair of denim shorts.